Lisa Anderson’s feature article in the May-June issue of Foreign Affairs, “Demystifying the Arab Spring,” offers few revelations for anyone who has been following the unrest in the Middle East and North Africa. The bulk of the piece is devoted to a fairly unremarkable, mainstream analysis of the differences between the revolts in Tunisia, Egypt, and Libya. That said, several statements made by Anderson are worth exploring in detail, as they shed light on one of the more central problems of our time: the inability of political commentators to recognize U.S. foreign policy for what it is. Why have the upheavals in Tunisia, Egypt, and Libya followed such different paths? Because of the countries’ vastly different cultures and histories, writes the president of the American University in Cairo. Washington must come to grips with these variations if it hopes to shape the outcomes constructively. For the United States to fulfill its goals in the region, it will need to understand these distinctions and distance itself from the idea that the Tunisian, Egyptian, and Libyan uprisings constitute a cohesive Arab revolt. This begs the question: what are the goals of the United States in the region? Surely one should consider the nature and moral legitimacy of these goals before making policy recommendations. Anderson doesn’t elaborate on what these goals are, perhaps considering them self-evident. Nor does she delve into whether they are compatible with minimal standards of human decency. In the Middle East and Southwest Asia, our overall objective is to remain the predominant outside power in the region and preserve U.S. and Western access to the region’s oil. That sentence was rewritten, along with a number of other passages, after the original draft was leaked to the New York Times. But the strategy remains the same. 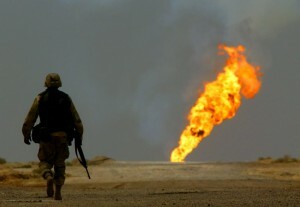 Oil access is the end goal of U.S. policy in the Middle East, the single overarching objective by which the success or failure of all subsequent policies are measured – not democracy or freedom or human rights. The policymakers know this, and they frankly acknowledge it when the cameras are off and their memos are intended for internal consumption only, as was the draft Defense Planning Guidance. Knowledge of this fact renders the vast majority of the “national discourse” utterly meaningless. This is because the debate inevitably centers on how the U.S. government should act in a given situation when the interests of the U.S. government dictate how it will act. Analysts like Anderson, who are unwilling or unable to recognize the fundamental nature of the American state, are destined to prescribe policies that not only will never be adopted, but could never be adopted by the U.S. government because they conflict so radically with basic state interests. This leads to policy prescriptions that are laughable on their face. For example, Anderson argues later in her article that the Obama Administration should use its influence to champion the Tunisian labor movement and restrain the power of the Egyptian military. Such analysis disregards the fact that a strong labor movement in Tunisia – or anywhere else, for that matter – is detrimental to the corporate interests that form the core of U.S. policy and flies in the face of more than a century of U.S. repression of organized labor (the assault on Iraqi trade unions since 2003 is just one of the more recent examples). Likewise, the notion that Washington would purposely hobble the Egyptian military – a reactionary force it has trained and funded for decades, and which serves as its closest ally in that country – is unthinkable. It is not a matter of improbability but impossibility. By advocating policies that would loosen the American military and economic stranglehold on the Middle East, Anderson effectively calls for the U.S. government to act against its own interests – to deliberately take sides against itself. This is something that will not and, more to the point, cannot happen, which is why she fails to articulate those “goals in the region” that her policies would ostensibly fulfill. She then engages in a bit of logical sleight-of-hand by ignoring the very existence of those imperial interests that her policies would threaten. Confronted with the revelations from the draft Defense Planning Guidance, her argument implodes. This sort of sophistry is dangerous because it pretends that supporting economic elites and repressing labor movements are not integral parts of the American system. It advances the fiction that the U.S. government does not have interests beyond those it publicly claims, and as a result presents a fantastically skewed picture of the world, one that cannot ultimately be reconciled with reality. The truth is that economic exploitation is not the exception but the rule, tracing a bloody path through U.S. history from slavery and the subjugation of Native Americans to the current oil wars in the Middle East. That is what the American state does and has always done. That is its purpose. That is its function. And so long as analysts like Anderson persist in their delusions, its operation will continue unimpeded.